The Non-Aligned Movement on Tuesday confirmed its support for a Palestinian bid for UN membership at a ministerial meeting here, Egypt's Foreign Minister Mohammed Kamel Amr said. "We will continue to support the Palestinian endeavors during the 66th session of the General Assembly for the recognition of the State of Palestine on the basis of the borders of the 4th of June 1967 with East Jerusalem as its capital, and to seek its admission as a full member in the United Nations," Kamel Amr told a press conference at the end of the two-day meeting. 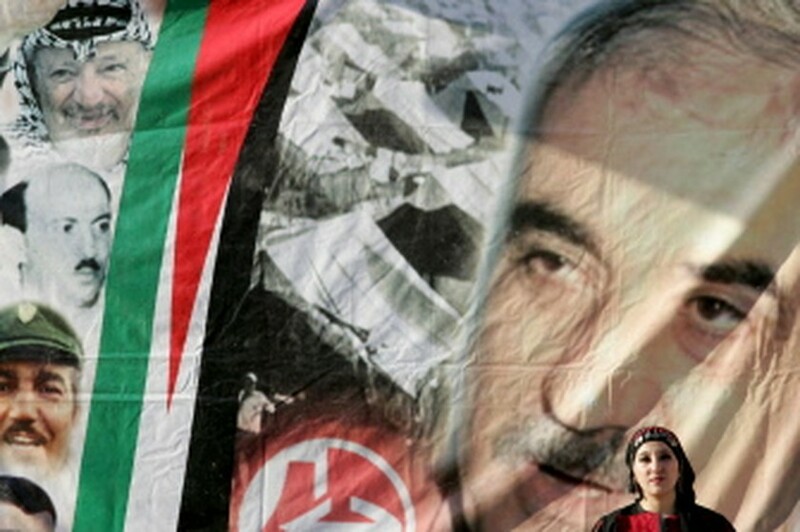 A Palestinian supporter of the Popular Front for the Liberation of Palestine (PFLP), gestures in front of a portrait of party leader late George Habash, during a march of support for the Palestinian bid for full United Nations membership. The Egyptian minister, who chaired the Belgrade meeting, recalled that most of the members of the Non-Aligned Movement (NAM) already recognise the Palestinian state. He could not however confirm that all 118 NAM member countries would vote in support of the Palestinian bid for UN membership when the UN General Assembly meets later this month. Direct talks between Israel and the Palestinians ground to a halt shortly after they were relaunched in Washington last September over the issue of settlement construction. Due to the impasse in the peace process the Palestinian Authority has launched an initiative to have the state of Palestine recognised within the borders that existed before the 1967 Six Day War. Palestinian leader Mahmud Abbas is due to present the bid for full UN membership on September 20 before the General Assembly despite opposition from the United States and Israel. The Non-Aligned Movement met in Belgrade to commemorate the 50th anniversary of the first summit of Non-Aligned Countries held in the same city in 1961. The founding fathers of the movement were Yugoslav leader Josip Broz Tito, India's first Prime Minister Jawaharlal Nehru, Egyptian President Gamal Abdel Nasser, Ghana's first president Kwame Nkrumah and Indonesian leader Sukarno. It was founded as an alternative to the bipolar Cold War world for developing nations seeking to keep a neutral course between the Western capitalist and Eastern communist blocs. It currently has 118 members, mostly from the developing world. The two-day ministerial meeting that opened Monday is mainly ceremonial and will not deal in depth with the so-called Arab Spring which has toppled or shaken regimes in long-standing NAM members like Egypt, Tunisia, Syria and Libya.